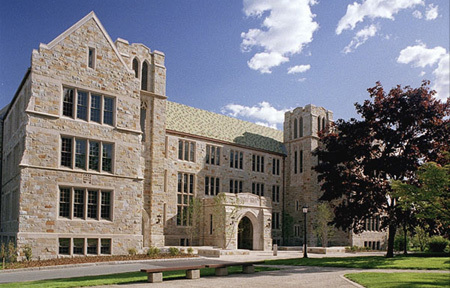 The Boston College Carroll School of Management provides undergraduate and graduate management education attuned to the needs of today's business world, developing leaders and managers who bring an ethical perspective to business decision making. Approximately 2,000 undergraduate and 800 graduate students enroll annually. Students gain leadership experience and develop personal and professional interests through experiential learning opportunities, an integral part of the curricula. At the heart of the Carroll School experience are a collaborative spirit and a proud tradition of service to the community. When you ask Boston College students what makes their MBA program special, many will tell you: It's the people. Indeed, BC's admissions department prides itself on selecting a diverse, cooperative, and accomplished student body, seeking students with a potential for success academically and in leadership roles. In recent years, incoming graduate bu...When you ask Boston College students what makes their MBA program special, many will tell you: It's the people. Indeed, BC's admissions department prides itself on selecting a diverse, cooperative, and accomplished student body, seeking students with a potential for success academically and in leadership roles. In recent years, incoming graduate business students at Boston College had an average GMAT score of about 663 and an average undergraduate GPA of 3.4. Though only two years of work experience is recommended before entering the program, the average student had 4.4 years of professional experience before beginning their MBA. Boston College boasts an “unbelievably beautiful” campus, and the location in the bustling city of Boston has many obvious benefits. Carroll School of Management’s stu­dents tend to be “motivated and outgoing” men and women in their “late twenties to early thirties.” The student body is “focused because they are balancing work and school, but are friendly and want to network.” The nature of the business program can make some students “competitive,” yet most students are “willing to help” and “interested in advancing their careers and those of their peers.” The environment is unlike “the cut­throat and pretentious culture that is infamous at other schools.” “Everyone knows one another because it is a small class,” and there are always events going on both on cam­pus and off. David H. Long, '89 - CEO & President, Liberty Mutual Insurance Co.
Want more info about Boston College, Carroll School of Management Full Time MBA? Get free advice from education experts and Noodle community members. What does the timeline for a Full Time MBA at BC’s Carroll School of Management look like?